The origin of this name which is more commonly recorded in England as "Allis", is French Huguenot, but its source is like the "English" variants from the Saxon pre 8th Century "Adalhaidis". This was a female personal name built up of the elements "adal" translating as noble, and "haid" meaning kind. It was equally popular with the Normans as well as the Anglo-Saxons and appears to have been introduced to Britain on three separate occasions i.e., the 8th Century, the 1066 Invasion and again with the Huguenot after 1628 and the repeal of the Edict of Nantes. The "first" recording in England is probably one William Aliz in the 1296 Duchy of Cornwall Register. The Coat of Arms was granted in France c. 1580 being a Wolf's head on a Silver Field. 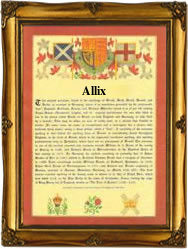 The first recorded spelling of the family name is shown to be that of David Allix, which was dated August 30th 1705, christened at the French Huguenot Church, Spitalfields, during the reign of Queen Anne, "The Last Stuart Monarch", 1702 - 1714. Surnames became necessary when governments introduced personal taxation. In England this was known as Poll Tax. Throughout the centuries, surnames in every country have continued to "develop" often leading to astonishing variants of the original spelling.